Meru. I liked it most when they were showing the footage that makes you squirm and makes your palms get sweaty. Wish they’d geeked out on the nitty-gritty climbing details more, and/or cut back on the talking heads. Sometimes the people who were there aren’t the best ones to tell the story? Pretty cool. Cf. 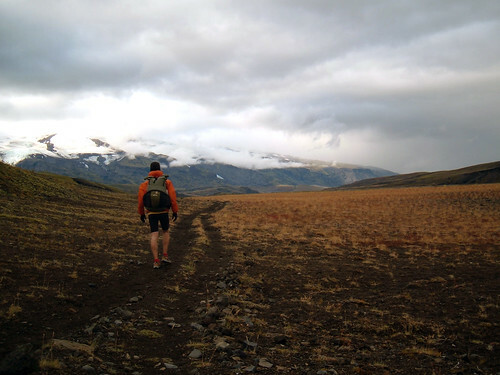 the Arctic 1000 traverse from a few years back, which crossed through the most remote part of Alaska. Also reminds me of some of the issues and ironies that William Cronon brings up in The Trouble with Wilderness. No one can yet predict exactly how quickly and in whom hypothermia will strike–and whether it will kill when it does. The cold remains a mystery, more prone to fell men than women, more lethal to the thin and well muscled than to those with avoirdupois, and least forgiving to the arrogant and the unaware. In other words, I’m doomed. I remember reading Jack London’s To Build a Fire and watching the short film adaptation in middle school. Love it. Keep your gloves on, folks. I used to be of the opinion that speed isn’t important. And, in an absolute sense, I don’t think it is. In a relative sense, however, I think that one’s speed does matter. This is because–relative to one’s innate ability–striving to operate as close to that ability as possible requires a level of commitment to the craft and presence in the moment that I have yet to achieve by other means. For instance, because I wanted to move quickly when climbing Gannet (or any mountain), I made a point to study the map carefully, read other trip reports, solicit advice from friends who had already made the outing. Not to mention spending countless hours in the mountains building skill and fitness (and having fun!). Without the impetus of speed I would’ve undoubtedly taken a more lackadaisical approach that likely would’ve left me irresponsibly underprepared, with less respect for the mountain, and, ultimately, less connected to both the landscape and the community of enthusiasts who venture into this gem of a mountain range. Going fast requires–above all else–paying attention, and achieving that fleeting measure of grace where my effort and abilities are meshed perfectly with the challenge is a huge motivating factor in what I do. I find that this practice of paying attention is one of the more instructive and valuable takeaways that a trip to the mountains offers me. 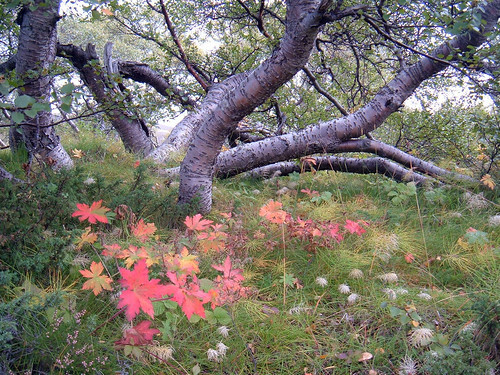 Plus, I’m just really inspired by wild landscapes. Up on the Dirt Pile. 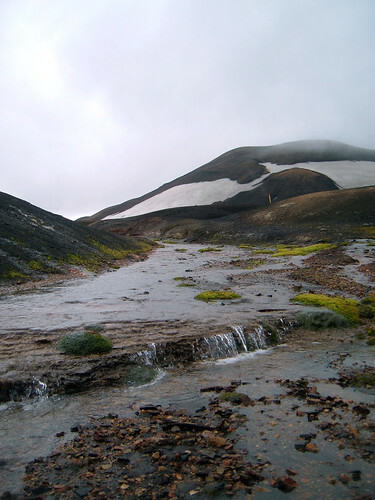 In mid-September [of 2008], just slightly off-season, I spent a couple days hiking Laugavegurinn (translates something like “the warm pools way” or “the hot springs route”) in south-central Iceland. 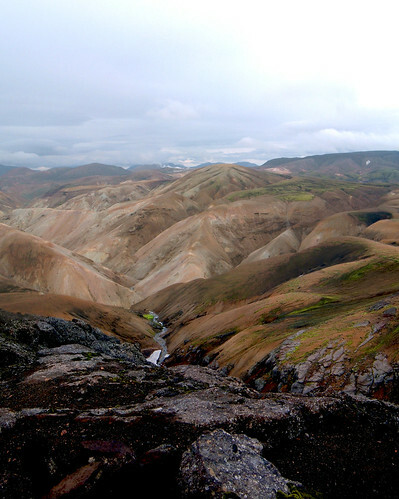 I started at Landmannalaugar and hiked south to Þórsmörk. 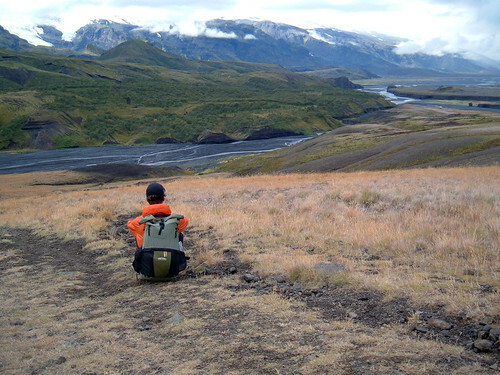 Immensely helpful in planning my hike, which I sandwiched between some tourist days, were Andrew Skurka’s Iceland page, Jonathan Ley’s Iceland photos and advice, and Ferðafélag Íslands, a group that maintains some of the very nice huts along the way. The weather wasn’t very extreme, but it did change frequently, like every half-hour or so. Temperatures were mostly in the mid-40s to high 50s F (5-10C). Low-hanging clouds mostly–just a few hours of genuine, full sunshine. 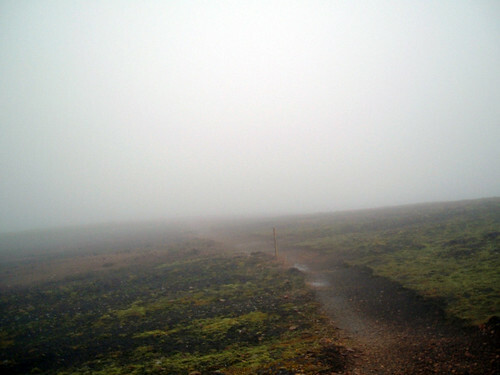 No terrible rainstorms, but the occasional rain changed to sun changed to mist change to light rain change to fog, etc. Heavy winds were common, as there was no tree cover until the last 30 minutes of my hike. 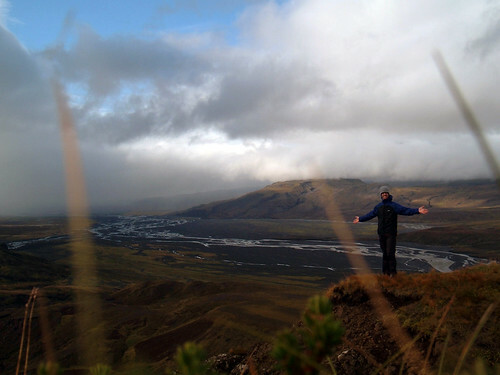 I made it over the crest of the volcano and back down, then stopped and warmed up at Höskuldsskáli hut for an hour or so. The old season’s snow had melted, and the new snow hadn’t yet arrived. So the next stretch was up and down and up and down a series of small creek valleys. The second morning featured several very cold river crossings. 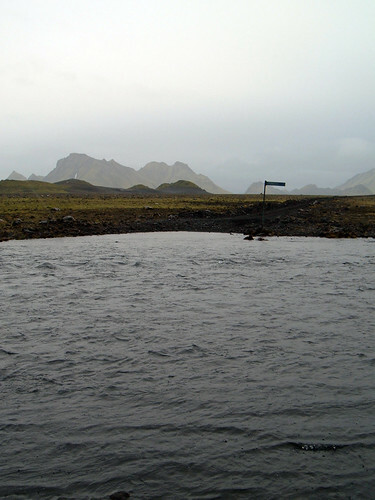 Bláfjallakvísl was easily the widest, deepest and coldest I’ve ever crossed on foot. Just over knee-deep at the worst, and really swift. NOT fun. VERY stressful. I had to run for about 10 minutes afterward to warm my frozen legs again. 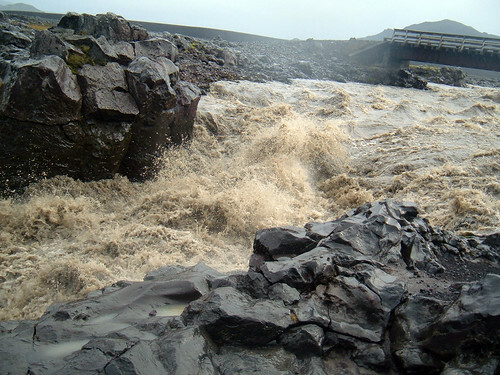 I was glad that the Nyrðri Emstruá had a bridge! 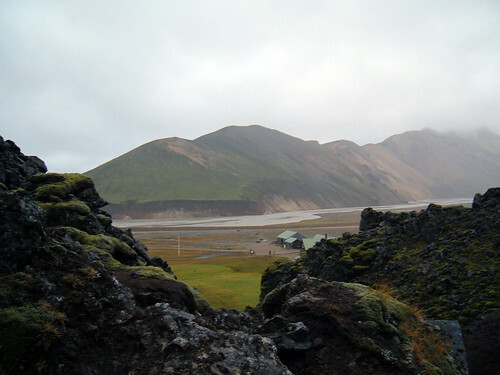 I finished the second day in the early afternoon at Emstrur/Botnar hut, so I spent a few hours trail running and exploring the surroundings, like the Markarfljótsgljúfur. 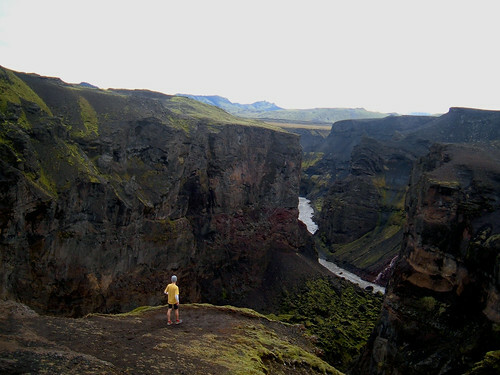 The Markar river canyon is about 500 feet/180m at the deepest point. 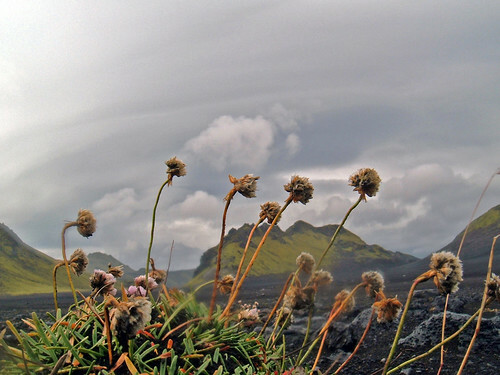 And lastly, I took a quick jaunt up Valahnúkur while waiting for the bus back to Reykjavik. I highly recommend this trail if you happen to be nearby. I’d gladly do it again.